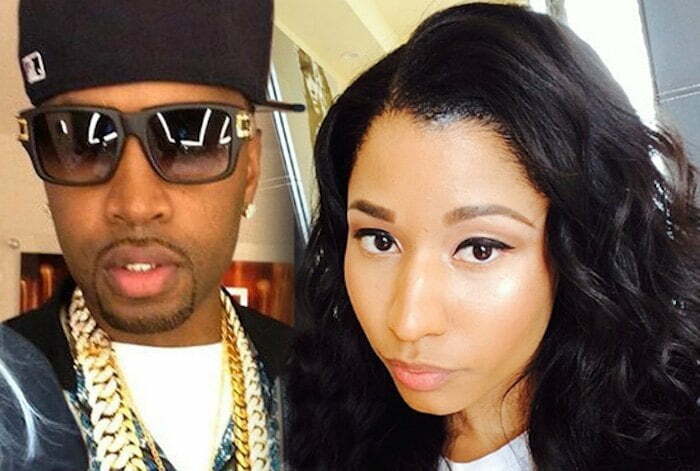 Safaree Samuels is exposing Nicki Minaj on Twitter as the whole Meek Mill saga deepens. On Wednesday night Nicki Minaj responded to a report claiming that she has been hitting up Safaree on the regular despite her budding relationship with Meek. “He knows when u hit me. He sees the entire convo so don’t purposely try to be misleading. That’s corny if it’s true. Wish u the best,” Nicki wrote on her Twitter timeline. 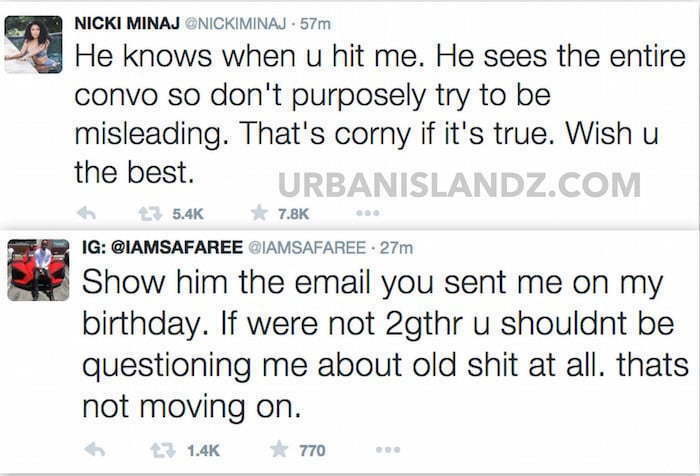 Safaree didn’t take too likely what she said and responded saying that she hit him up via email on his birthday. “Show him the email you sent me on my birthday. If were not 2gthr u shouldnt be questioning me about old sh** at all. thats not moving on,” Safaree wrote in response to his ex-girlfriend on his Twitter. Earlier this month, Safaree did tweeted about someone sending him an email on his birthday weekend. “Its my birthday weekend and your emailing me bullsh** trying to ruin it.. Leave me alone allll the way 4ever! thank God im a freee mannn! !” he tweeted on July 3. 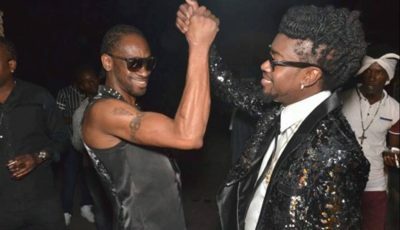 Sources told Urban Islandz that Dreams Worth More Than Money rapper and the Trinidadian rap diva have been fighting since yesterday and the tension between them is even evident on their tour. While performing in Miami on Tuesday night for their PinkPrint tour stop, Nicki and Meek didn’t show their usual affection on stage. Instead, they performed on either side of the stage. TMZ sources also confirmed that Safaree is telling his people that Nicki Minaj still reaches out to him from time to time. The “Truffle Butter” rapper still has not said anything about Meek Milly’s rant on Twitter about her boyfriend being gay and Drake not writing his own raps. On Wednesday the Philly emcee was still ranting on Twitter about who is fake from who is real in the industry. “I pray the real live forever and all the fake get exposed!” he wrote. I pray the real live forever and all the fake get exposed! ? And I only speak facts remenber that! Do you think Safaree and Nicki should get back together? Sound off in comments below. Nikki seems very controlling its her way or the highway . In life what goes around comes around . Nicki Minaj really had to do something really bad to this dude why he hate her so much. Nicki you have problems leave the man alone because clearly that is what he want.